Justin Morneau’s battle with post concussion symptoms has been in the headlines for nearly two years. It’s a shame seeing a player of his caliber lose that much time to such a mysterious, frustrating injury, especially in light of his MVP-like start to the 2010 season. Professional sports of course, is an unforgiving business and one player’s misery is often another’s opportunity. Enter Chris Parmelee. The 24-year-old firstbaseman received an unexpected call-up last September from Double A after Morneau was shelved for the season. He played well, hitting 4 homeruns in 76 at-bats and kept the momentum going into spring training. 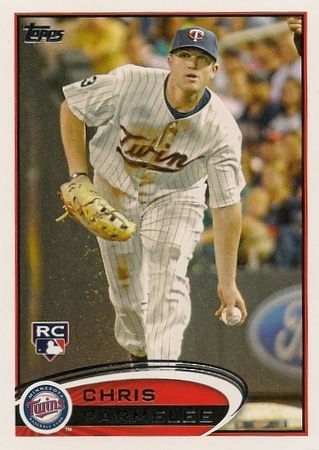 When the Twins decided in March that Morneau would be the team’s primary designated hitter, it opened the door for Parmelee to not only make the roster, but take the field at first base on opening day. Parmelee and I hooked up for a quick chat during last week’s homestand. DZ: You are back up here, made the opening day roster for the first time, that has to be pretty exciting for you. PARMELEE: Yeah, that was awesome. Being on the opening day roster is something that’s real special. It’s opening day - there’s not much more to say about it. It’s opening day, everybody is excited to get back on that field where the games start to mean something again…it was pretty cool. DZ: What was your mindset going into spring training, did you think you had a really good chance at making the team? PARMELEE: I came into spring training fighting for a spot and trying to go up there and have good at-bats. In spring training, you’re knocking the rust off and things like that - that’s what spring training is for. I just went in and tried to put some at-bats together, put some good wood on the ball and it worked out for me. DZ: How much did the experience last year help? PARMELEE: I think it was huge. I came up last year in September and coming back up here to start the season this year, it felt like…it was huge playing up year last year in September and it felt like I came back to a familiar place…it all kind of went together. DZ: How much have you worked with Justin Morneau at first base? PARMELEE: Morny has helped me out (a lot). Also Tom Kelly, working with him in spring training, it was huge. He’s a wealth of knowledge over there at first base and he’s got a lot of experience over there. Listening to those two, TK and Morny, has helped me out a lot. PARMELEE: Yeah, Morny, myself and Joe, we get over there and talk about some situations and stuff like that in batting practice. That’s been a huge help. DZ: Those are good guys to get to know on the team. PARMELEE: (laughs) Absolutely. They are great guys. DZ: I was here late last year and talked to Joe Benson a little bit. He talked about how you guys have been inseparable…What’s it like with you being up here this time and him not? PARMELEE: Joe is an extremely, extremely talented player and he’ll be up here soon. Like you said, we’ve been inseparable pretty much since we were drafted. It’s a little bit different not seeing him in the clubhouse, but, like I said, he’ll be up here real soon. This entry was posted on Saturday, April 21st, 2012 at 8:29 am	and is filed under MLB, Twins. You can follow any responses to this entry through the RSS 2.0 feed. You can leave a response, or trackback from your own site.